yomiuri « Japan, Hockey, Baseball, etc. A 2 year deal with details still to be hammered out. He’ll likely be their No.2 starter since the Orioles only have Gutherie in their vacant rotation. Two industry sources have confirmed that the Orioles have agreed in principle on a two-year deal with Japanese right-hander Koji Uehara. The deal is pending specific contract language and a physical, which is expected to occur possibly later this week, though an appointment in Baltimore has not been scheduled. 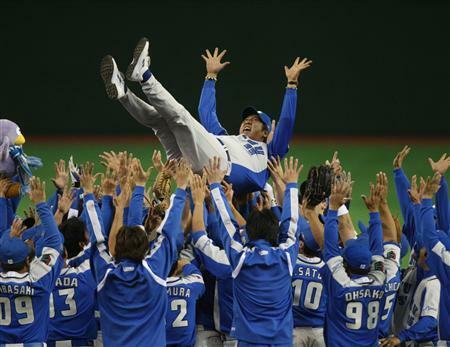 World Baseball Classic 2009, Asian teams warm up games that take place in Japan has been officially announced. Interestingly Australia will play 2 games early against Japan (in 2006 it was Japan vs PL and Japan vs CL at Fukuoka, if I remember correctly). Also, Japan seems to have set up the warm up games and tournament schedule with full control of the schedule, giving Team Japan 3 days rest between the last warm up games while Korea and Taiwan only get 1 day of rest. And Japan gets the first of 2 wins needed to enter round 2 of WBC out of the way early with its opening match against China all but guaranteed. It’s obviously rigged in Japan’s favour as hosts for the Asia round, but this tournament is still in its infancy and this is one of the kinks that needs to be worked out in the future ensure better fairness. Giants and Lions are rewarded(?) with the right to play against the 4 Asian WBC teams in warm up games. Well, Yomiuri’s involvement is obvious what with Yomiuri Shimbun newspaper being a WBC sponsor. 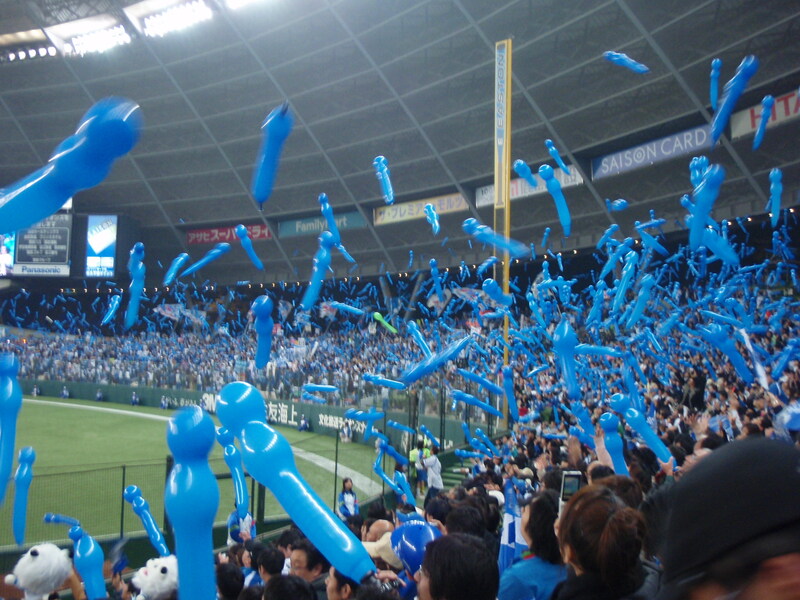 The Saitama Seibu Lions are the 2008 Japanese champions having won a thrilling game 7 against archrival, and the New York Yankees of Japan, Yomiuri Giants 3-2 in the deciding game. The guys at the Tokyo Yakult Swallows blog has what I know as the fastest championship game write up. The Lions overcame many obstacles, like missing sluggers GG Sato and Craig Brazell (well, the latter was an OBP black hole so I don’t think he was missed much) from September on, and losing the starting catcher with some pop in Toru Hosokawa and having 5 tool shortstop Hiroyuki Nakajima injured in game 5 where the team outhit the Giants but were unable to come up with any clutch hits or extrabase hits (except for a late solo shot). 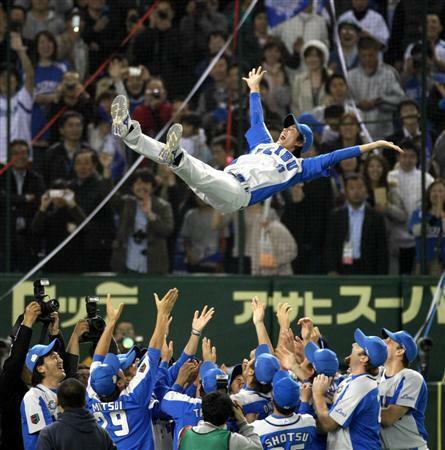 Some photos and movies from game 5 at the Seibu Dome on Thursday 6 November. Game 6 swung the other way as the Giants were unable to capitalize on numerous opportunities, and Seibu in a desperate move brought in game 4 starter Takayuki Kishi on 2 days rest in the 4th inning to put out the fire. He went on, incredibly, to finish the game. It was like watching high school baseball with the ace always ready to pitch in any game. Hopefully Kishi’s arm hasn’t received any permanent damage from this, many Japanese pitchers have their careers ruined by overuse, but then again some have genetically freaky rubber arms like erstwhile Lion and current Boston Red Sox Daisuke Matsuzaka. Game 7 was a thriller from start to finish, with declining veteran and long time team ace Fumiya Nishiguchi being handed the ball to start off the game. 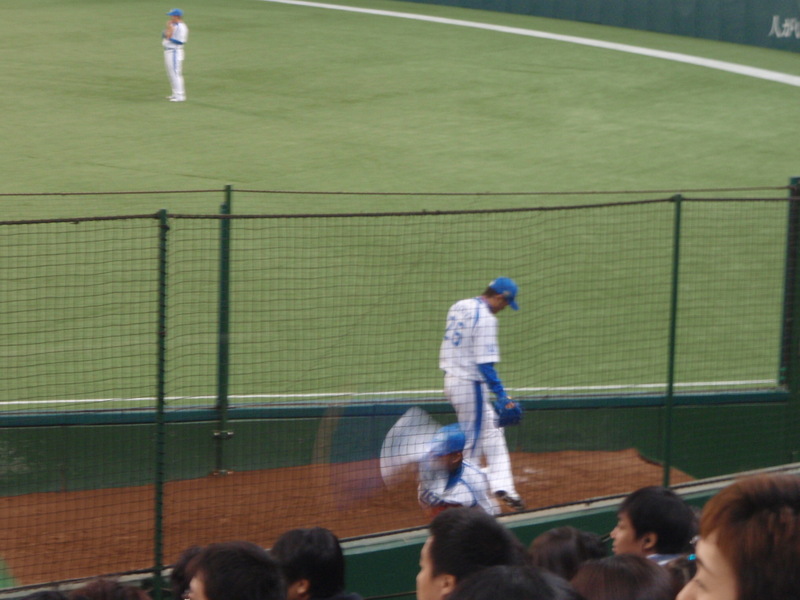 He was shaky and gave up 2 runs in 2 innings and was substituted for pinch hitter Akira Etoh. Then the Lions pitchers proceeded to shut down the powerful Giants lineup with 2 innings each from starters Kazuhisa Ishii and Hideaki Wakui, an inning from reliever Tomoki Hoshino, then 2 innings from closer Alex Graman, all perfect in relief not allowing a single runner on base. On the offensive side, the second pinch hitter in the game Hiram Bocachica hit a homerun to make it a 1-2 game (then he proceeded to swing for the fences on succeeding at bats being easily struck out by high fastballs out of the zone, but that’s here nor there). Then in the 8th Giants reliever Daisuke Ochi became shaky in his 2nd inning of work and hit leadoff hitter Yasuyuki Kataoka (who was delighted to be able to get on base and even clapped his hands after being hit) who promptly stole 2nd on the very next pitch, then Takumi Kuriyama bunted him over to 3rd and Nakajima drove him in with a grounder to short to tie the game. Inexplicably (but luckily for the Lions) Ochi was left in the game to walk cleanup hitters Takeya “Okawari” Nakamura and Taketoshi Goto before allowing the hit by Hiroshi Hirano to drive in the game winning run, and that’s all Seibu needed to seal the deal (though driving in Shogo Akada from 3rd with no outs in the 9th would’ve been a nice insurance). Kishi took home the series MVP having won 2 games. His first win was an absolutely impressive complete game shutout in game 4, then he went on to save the day in game 6 on 2 days rest. 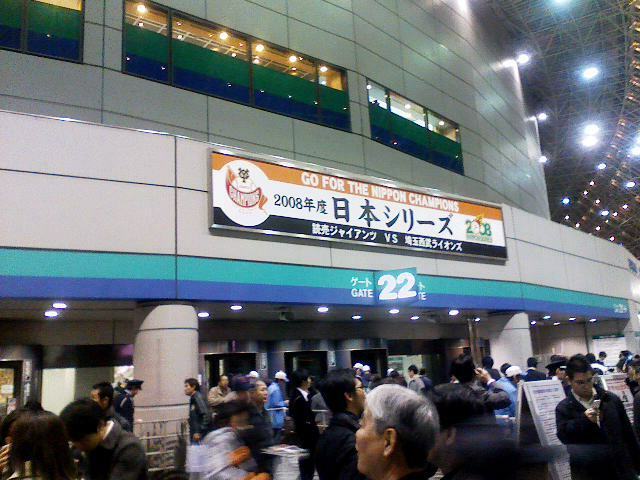 Anyways, congratulations Saitama Seibu Lions, you are the 2008 Japanese chamions!! Interleague games officially ended on Monday but the title was clinched by the Fukuoka SoftBank Hawks on Sunday, even though they tied with the Hanshin Tigers with 15-9 records. The silly tiebreaker rule doesn’t take head to head record into account, if that were the case the Tigers would’ve won the (still) rather meaningless Interleague crown because they took 3 of 4 from the Hawks (also won 3 against the PL leading Saitama Seibu Lions). Anyways, after a few days off (scheduled as reserve dates for rainouts), regular intraleague play resumes tomorrow with a full slate of 6 games. Anyways, here are how things shook out following the conclusion of the Interleague period. Tied for best record in Interleague without having the advantage of playing against the sorry Yokohama BayStars, and beat up on the PL leading Lions and Interleague Champs Hawks. Most balanced team in the league with an on base juggernaut offense (top 3 CL OBP leaders, and only hitters to have OBP over .400 in CL are Kanemoto, Akahoshi, and Arai, and Toritani checks in at 8th with .362) So the Tigers lead the league in runs scored (273) despite homering the least (35), and their shutdown bullpen helps prevent runs big time and they lead the league in this category too (218). The complete package. Regains the penultimate position in this ranking largely thanks to the Lions tailspin at the end of Interleague, as the Dragons only had a .500 record against PL teams, but managed to take 3 of 4 against Seibu. Ended Interleague campaign on a horrible note, losing 6 straight and 9 of the last 12. 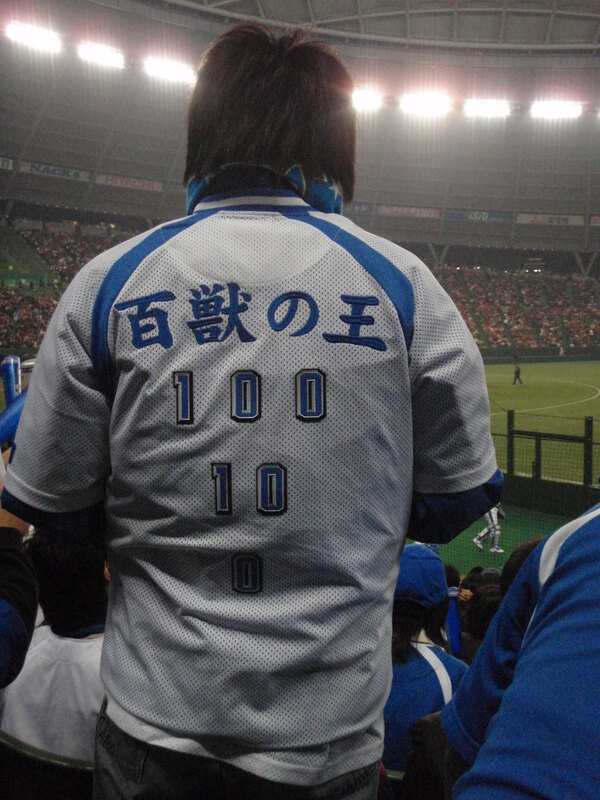 Even losing both games to the lowly BayStars. This is still a strong team and PL race has just gotten really interesting with the slumping Lions and soaring Hawks as the top 4 teams are now bunched together within 4 games of eachother. Lions are probably thankful that what turned out to be a dreaded Interleague season is finally over. Was in the hunt for the Interleague title going into the final weekend, the team continues to win close games as the Fighters have only outscored their opponents by 4 runs for the season. A team with very good fundamentals (310 – 256, RS – RA) sits in 4th place in the PL standings but definitely has the capability to be in a playoff position and should be there sooner rather than later. Had first ever winning Interleague season in its history with 13-11 record. Interleague champions nudged their way up to claim the 3rd and final playoff position in the PL. The team seems to have woken up, it’ll be interesting to see if they can keep this up in their own league. Solid Interleague campaign of 14-10 has the team back in black. Good pitchers Takahashi and Uehara are returned to the big club after rehabbing from injury. The former should go into the rotation and the latter in the bullpen where he was a successful closer last season. Beneficiary of the new Free Agency rules agreed upon between NPB and the Senshukai (Players’ Association) reducing the number of years of service until domestic FA to 8, a quirk in the rule allows FA eligible imports to not count as imports, meaning that slugger Alex Ramirez will not count against the import quota starting next season. Norichika Aoki is back and has been his awesome self with a slash line of .331/.391/.506. NPB hitters may be getting wise to the ways of the Lim though, as the closer has given up 5 runs (4 earned) over his last 5 appearances. Aaron Guiel’s rehab seems to be going well, as he’s played 2 games in the minors recently (going 0-3 with a walk), hopefully he’ll be fully recovered soon and back with the big club. An Aoki – Hatakeyama – Guiel cleanup could be pretty awesome. Only team to win less than 10 games (.417) in Interleague, the sad BayStars went 6-18 (.250), their saving grace was the sweep of the slumping Lions at the end of Interleague. U-G-L-Y. NPB Tracker has a good run down on the 33 year old Yomiuri Giants right handed pitcher Koji Uehara who announced in early April that he was going to the major leagues next season. This was a highly unusual move from Japanese players who are taught not to rock the boat, but not totally unexpected from this vocal character who had repeatedly declared his MLB ambitions while getting his posting requests denied by the team in the past. His career numbers from 1999-2007 are 106-57, 2.96 ERA, 1459.1 IP, 1304 K, 190 BB, and 172 HR. He started off this season with an injury, which explains his record of 0-4, 6.75 ERA in 5 games started and 29.1 IP. He’s still rehabbing and hasn’t made an appearance in the minors yet, so his return is still a ways off (Edit: Uehara is back with the big club as of today without making a rehab appearance in a minor league game), and when he returns he’ll go to the Giants bullpen to setup for closer Marc Kroon if things go according to plan. He’s not getting any younger, but being an extreme control pitcher (never having walked more than 28 batters in a season, even though he’s pitched 200+ innings twice in his career and 160+ innings six times) in the mould of Greg Maddux, he could age well and can be a fine pick up for an MLB team as a #3 starter or so.